In countries where multiple political parties govern in coalition (as in many European countries), survey respondents who indicated support for any parties in the coalition were grouped together. In Germany, for example, where the center-right CDU/CSU governed with the center-left SPD at the time of the survey, supporters of all three parties were grouped together. In countries where different political parties occupy the executive and legislative branches of government, the party holding the executive branch was considered the governing party. Survey respondents who did not indicate support for any political party, or who refused to identify with one, were considered to be not supporting the government in power. In some countries, no respondents identified with one or more of the parties currently in a coalition government. For example, the National Democratic Alliance in India officially consists of dozens of political parties, but many of those were not identified by any respondent as the party they felt closest to. Countries where an insufficient number of people identified with any party in government have been excluded from the analysis. 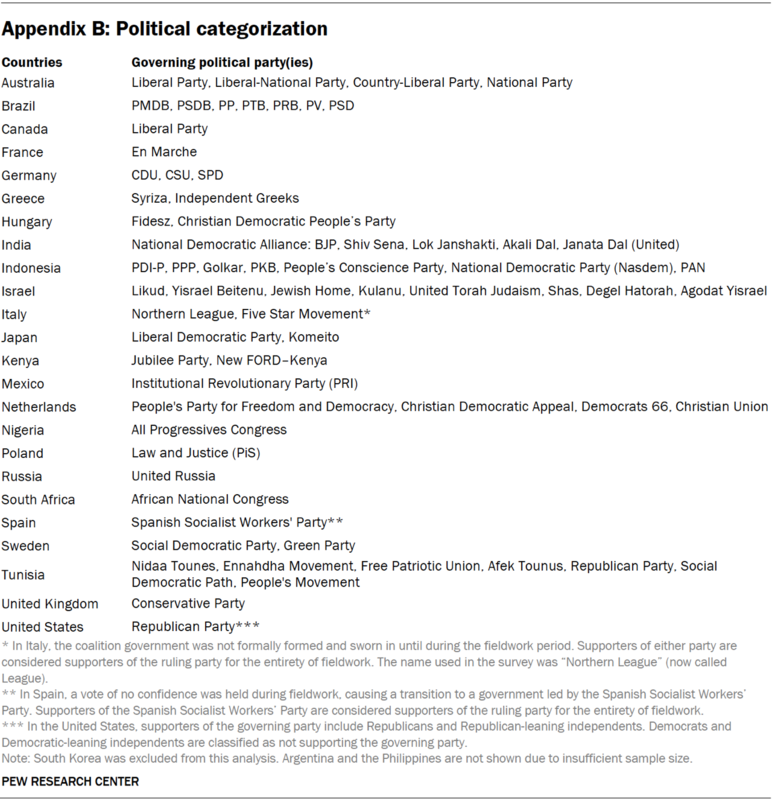 Below is a table that outlines the governing political parties in each country; only political parties mentioned by respondents are shown.